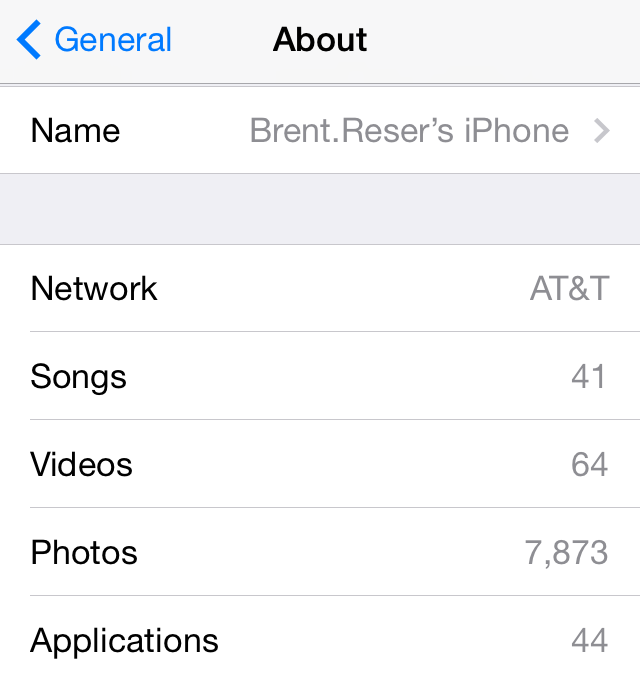 In February of 2014, I wrote about three issues I was experiencing with my iPhone 5. Now, almost two years later, I have three different issues with my iPhone 5S. However, this time around I am not asking for help. I know what I got to do to solve the minor problems. But, for the sake of a blog post and for the satisfaction of a few people, I will outline my issues tonight. Can’t View New Emojis – Perhaps I see no character on my phone more than the alien enclosed in the square box. Because I have neglected to update to iOS 9 (or iOS 8 for that matter) I can’t use, access, or view the cool new emojis released in the latest version. Why haven’t I conformed with the times? I have not had the storage available to do so. I know what you are saying right now…free up storage. Easy for you to say. I can’t get myself to go through and start deleting my 7,800+ photos. It isn’t even about losing the photos because I have always known I could just save them on a standard flash drive. You see, the real reason why I have let the images command all the space on my phone is because I have the silly anxiety of not having access to them on my device at any given moment. I face that anxiety head on tonight. I will soon be dumping my photos on a mass storage device and deleting them from my phone. Not only will I now get to go nuts with the new emojis, I will also appease my friends and family. I guess operating on an old software update really messes up group messages. I don’t go hard on music and apps but I do like to take photos. 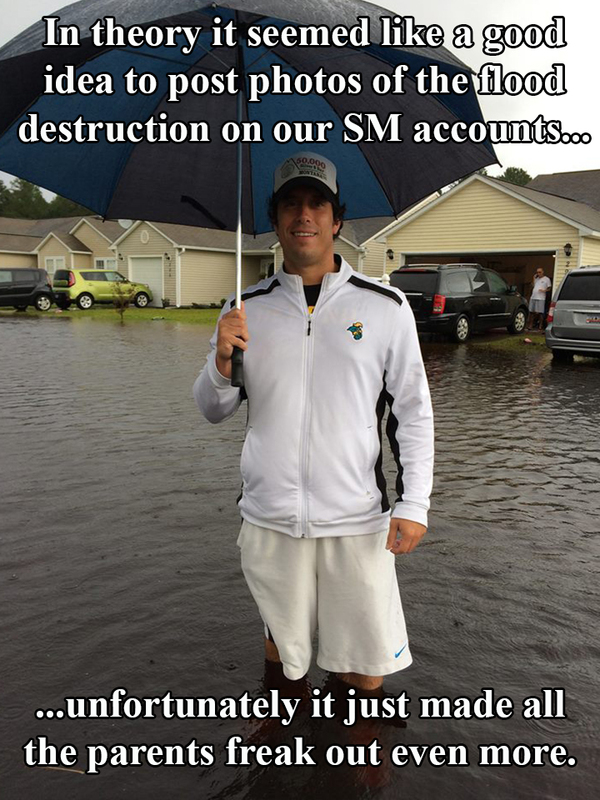 Stock Up on Those Chargers – I was so frustrated last night. I returned to my apartment from Sidney’s house and realized I had left my charger at her place. I depend on my iPhone to do my job, keep me informed, and to get me up in the morning so I knew I had to take immediate action. As Sidney lives 20 minutes from where I live, I went to the Wal-Mart 10 minutes away and bought a cheap $10 cord that would suffice for the night. I plugged it into my computer and watched as my batter life went up about a percent every five minutes. I wouldn’t have been so mad if this exact same thing didn’t happen a little over a month ago. I left Sid’s to go work a Coastal football game and sure enough I left my charger at her house. 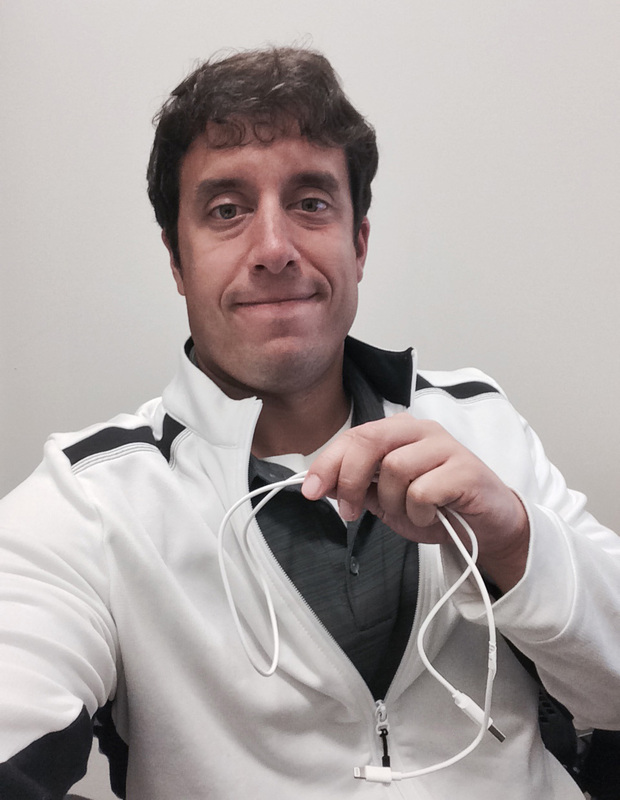 Knowing I couldn’t do my job without a healthy charge on my phone, I stopped at the Wal-Mart right next to the university and bought the same model rinky-dink cord I purchased last night. Although I now have charging sources at my apartment, Sid’s home, and work, I am asking for high quality chargers for Christmas. These 3-foot-long cords with no adaptor just aren’t doing it for me. I used this flimsy charger at work today. Misplaced Apps – Nothing is more confusing to look at than when I take my phone out of my pocket and realize something is a bit off. I get used to apps filling up my screen so it is a bit unsettling when I see an empty spot on one of my home screen pages. Even more infuriating is that I usually can’t place a finger on what app I accidentally deleted. Do you know what I am talking about? If you activate a command on your iPhone you can make your app icons shake and all that is needed to delete is by pressing down on the one you want to get rid of. Depending on the type of pants I am wearing and what exactly I happen to be doing, I inadvertently delete apps much more frequently than I would like. When I notice I have done such a thing I usually can’t remember which app I deleted until the time comes down the road when I need to use it again. I need to get to the bottom of what pair of pants is conducive to app deleting and stop wearing them! So there are my first world problems for you. Please excuse me while I get to deleting some photos. Don’t Blink. NOTE: Brent grudgingly took the Thanksgiving weekend off from Don’t Blink. Lucky for him, Brent’s fiancé, Sidney, wrote the Sunday blog post. Enjoy today’s entry where Sidney explains an alternative therapy that was administered to her as a child. On a regular basis Brent and I like to binge watch syndicated episodes of Dateline. The OWN network regularly broadcasts marathons of the “real-life-mystery” series, and it never fails, Brent and I get sucked into the drama. In one of the more recent episodes, Brent and I watched (forgive me, for I don’t recall the exact details) one of the key witnesses to a murder give a full recollection of the crime while in a subconscious state. What does that mean you ask? The key witness was under hypnosis. That’s right, a forensic hypnotist came in, hypnotized the woman, and she recounted the whole crime then and there. Now, I know what you’re thinking….What a load of baloney!! I get it. It sounds outlandish. Even Brent let out a big “Oh! I’m SURE! !” upon hearing the tactics of the prosecution. No, no, no. I, myself, underwent hypnotherapy as a kid. Now before I get into the logistics of the matter, let me explain “hypnotherapy”. It was not “therapy” where you lay on a couch and talk about your feelings and seek answers and guidance to your everyday problems. It falls more under the umbrella of physical therapy, in that the therapy is focused on helping to heal your body, and less of your soul. I’m sure by this point, I have piqued your interest and you find yourself wondering Why, oh why, did Sidney need to heal her body? My answer is somewhat anti-climatic. 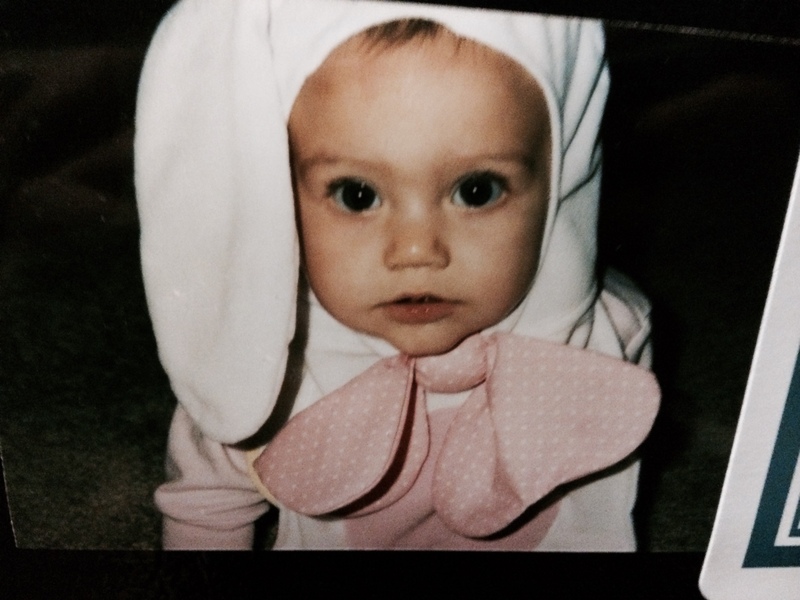 As a kid, I was diagnosed with an auto-immune disease known as Ulcerative Colitis, or UC. ( It’s a disease closely linked to Crohn’s disease but not quite as severe.) Anyway, like most auto-immune diseases, UC can have a plethora of linked ailments. One of the ailments that I suffered with was associative migratory joint pain. In laymen’s terms, my major joints (hips, shoulders, knees, elbows) would become inflamed and ache in a way that was very similar to the arthritis pain of a geriatric. Not fun for an 8 year old who just wants to run and play. As a child, Sidney was given an alternative treatment to manage UC. All of the treatments I was undergoing to get my UC and the associated joint pain under control proved to slowly improve my condition. Keyword: slowly. So, because the medicines took a long time to make a significant change, it was recommended that my parents take me in for hypnotherapy to help with pain management. So off my parents took me to a very skilled hypnotherapist. This particular hypnotherapist was world renowned. She had undergone several surgical procedures herself without the aid of anesthesia, she was only under hypnosis. I mean, WOW! So all in all, our “sessions” (if you will) consisted of her teaching me the ways in which to hypnotize myself. Then once in a lucid/hypnotized state, she would speak repetitive phrases to my subconscious. Some such statements would be “allow your body to heal itself”; “let the inflammation within your joints and digestive system slowly dissipate”; “allow the pain receptors in your body to become less receptive”. In saying all of things aloud, I agree they sound far-fetched and bizarre. But let me be the first to tell you…it worked. There were nights as a kid where my legs and arms ached so badly that I couldn’t move or sleep. But if I would hypnotize myself and listen to a tape (the hypnotherapist lived hours away, so she would record our sessions for me to use at home) I could finally rest and feel some relief. I will be honest. I don’t know the science behind this type of therapy, but I can vouch for the fact that it works. Nowadays, I am in full remission from my UC (2 years and counting), so hypnotherapy isn’t a necessity. But I will say that I do use it from time to time (mostly just to help myself fall asleep on planes). So if you are ever watching an episode of Dateline and they bring up forensic hypnosis, don’t write it off immediately. It is indeed, very real. As my lovely fiancé likes to say, Don’t Blink. Last night was bittersweet. Over a special evening that included a delicious dinner and fabulous fellowship, Sidney and I completed our Pre-Cana classes. It was sweet in the fact that we finished a major step in the process that will lead to our wedding at St. Andrew Catholic Church on June 11. It was bitter because it marked the end of our formal relationship with Tim and Kathy McCormick, our incredible sponsor couple. Sidney and I with our sponsor couple, Tim and Kathy McCormick, last night. The Catholic Church, along with other churches as well, require that engaged couples go through marriage prep before tying the knot in a church-sanctioned ceremony. 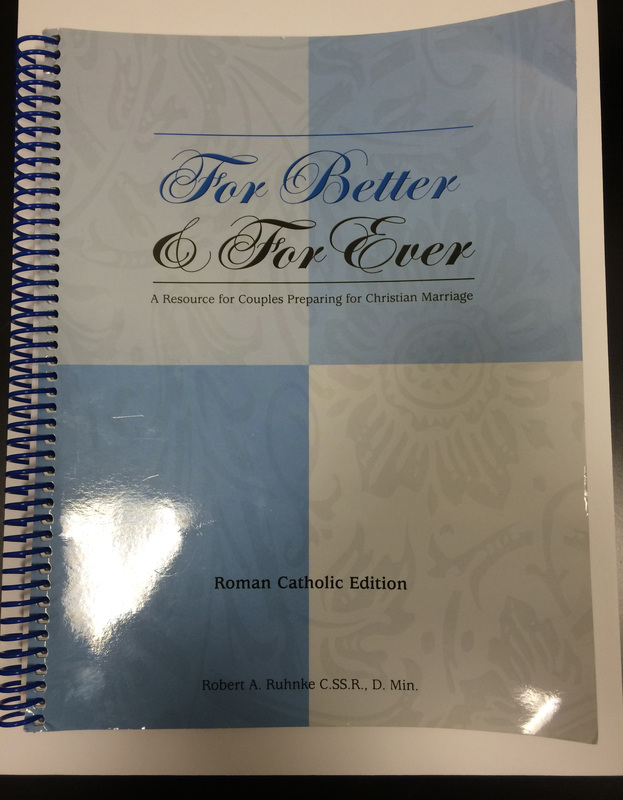 For Catholics, a main portion of this preparation is Pre-Cana, or, in non-Catholic terms, marriage counseling. At some churches, the priest or a parish employee will administer the counseling. At St. Andrew, married couples provide it. For six weeks, Sidney and I went to the McCormick’s home for counseling sessions. These meetings were structured by a Pre-Cana workbook that Sidney and I each received. We would read the material and answer questions corresponding to the chapters we would cover that week. We would then sit down at Tim and Kathy’s kitchen table and go over the material. Topics we discussed ranged from prayer to problem solving to sexuality to money to traditions to family planning. To have the opportunity to discuss these prominent aspects of marriage with such a strong and seasoned couple was invaluable. A look at my Pre-Cana workbook I used these past six weeks. But we got so much more out of the past six weeks besides the scripted lessons. 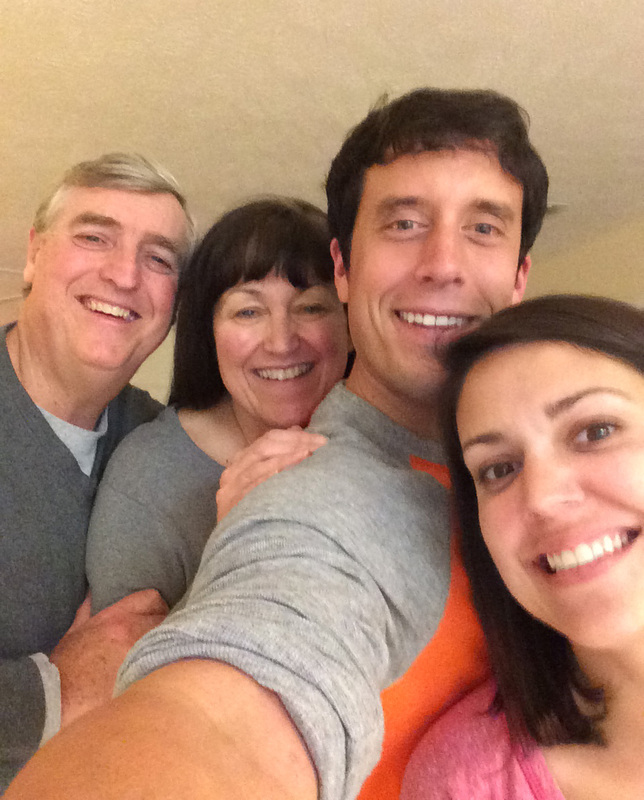 Each time we arrived at the household, Tim and Kathy warmly welcomed us. They set out snacks on the table. They discussed our days with us. Sid would talk to Kathy about classroom issues (both work at schools) and Tim and I would talk sports. We would swap stories. We would all give updates on our own families. It was such an enjoyable time as both Sid and I looked forward to each Tuesday evening. Sitting down with a proven, fruitful couple that has been married for over three decades was a wonderful experience for Sid and I. While we both have parents that have also lived out beautiful marriages of similar lengths, it is different when the couple isn’t your blood. You just observe different things and ask different questions. Along with the examples that my mom and dad and Sid’s mom and dad have set for us, the McCormicks will be the other powerful marriage that we look to for inspiration and guidance once we begin our own journey. 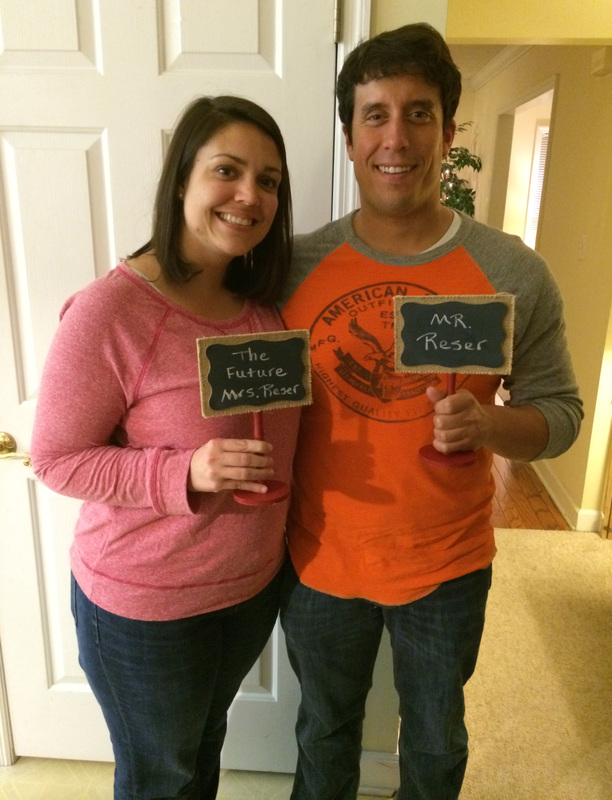 Tim and Kathy made us these tags that they placed at our spots at the kitchen table. I started this post talking about the incredibly nice evening we shared last night. To be technical, our counseling actually ended last week. However, Tim and Kathy wanted to have us over for an evening that wasn’t tied to book chapters and discussion questions. The couple rolled out the red carpet for us as not only did they cook a wonderful meal but they also took great care in setting the table. We talked casually and freely about several topics, including the lighter parts of our wedding such as the rehearsal dinner and honeymoon. It was the perfect way to end our six weeks together. 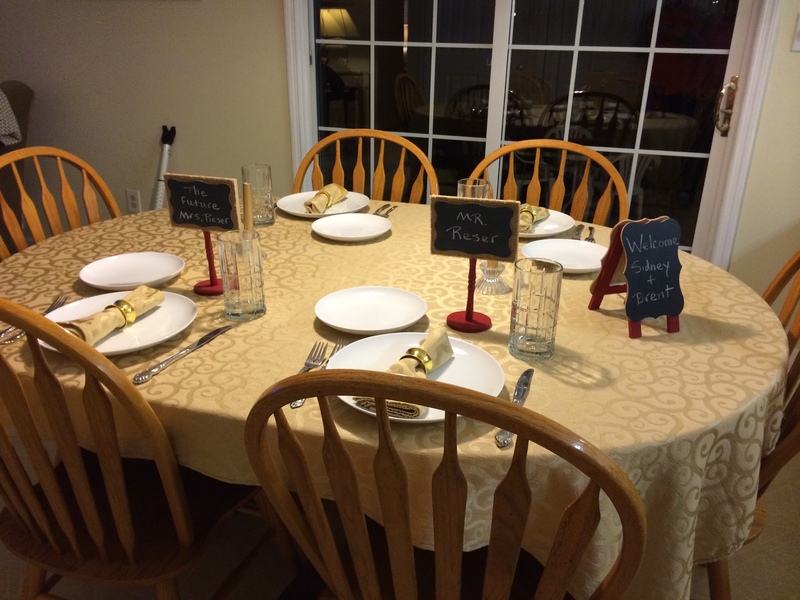 This was how the McCormick’s set the table for us last night. To those engaged couples who might have two or three different options when it comes to fulfilling their Pre-Cana requirements, I strongly encourage electing to work with a sponsor couple. You will get a lot out of it. Sidney and I can’t thank Tim and Kathy enough. We respect both of you greatly and admire how you have let God play such a large role in your marriage. Know that a wedding invite will be coming your way as we can’t wait to introduce you to our parents. Don’t Blink. My favorite topic over the past 18 months has seemed to center on the struggles of McDonald’s. Despite very rarely frequenting the restaurant itself, I have taken an interest in the rocky road the company has had to navigate. When implementing this new system, the McDonald’s employee you are chatting with at the intercom will first ask if your order is correctly displayed on the monitor. Then, when you pay at the first window, another employee (or perhaps the same one from the intercom), will repeat your order and ask if it is still accurate. Finally, at the second window, the employee who hands you your food will tell you exactly what is in the bag. He or she will also leave the bag open instead of folding it to offer even greater transparency. Would you believe it?! 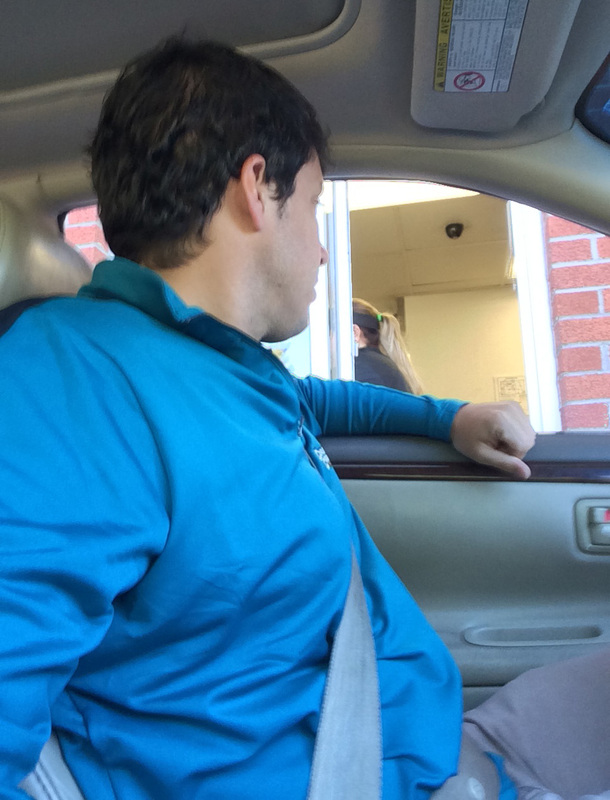 I went to McDonalds today and managed to capture my experience through the drive-thru. Although McDonald’s admits that it might take a little longer to receive your food, I don’t think many of us can complain. 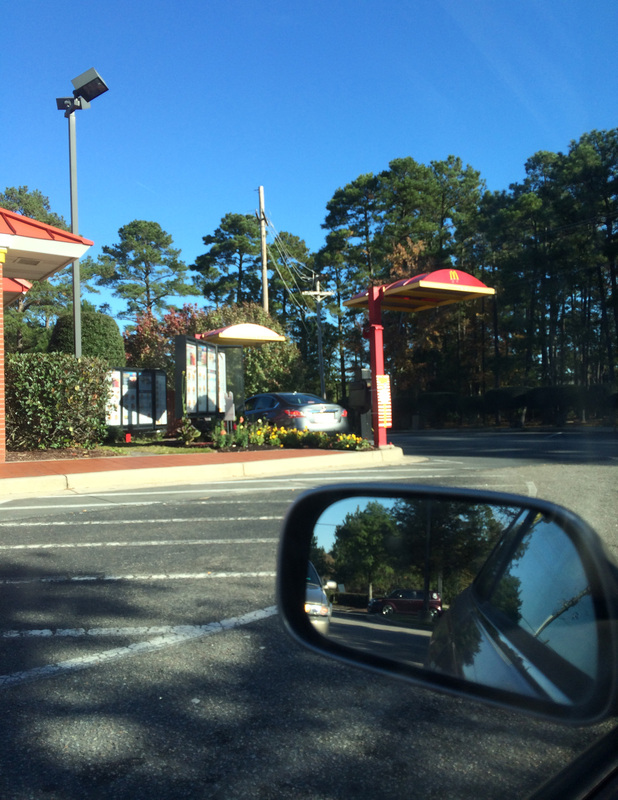 If you are like me, a botched order can completely ruin your fast food experience. I remember several occasions when I was little and my parents took us through the McDonald’s drive-thru and things didn’t go as planned. Perhaps nothing got an 8-year-old Brent more angry than biting into a supposed plain cheeseburger only to have it oozing ketchup after the first chunk was in my mouth. Yuck! Things haven’t changed that much in the present day. On occasion, I still receive sabotaged orders at the drive-thru window (one of the many reasons why I don’t eat fast food often). Dinner ruined. Timing is always funny. 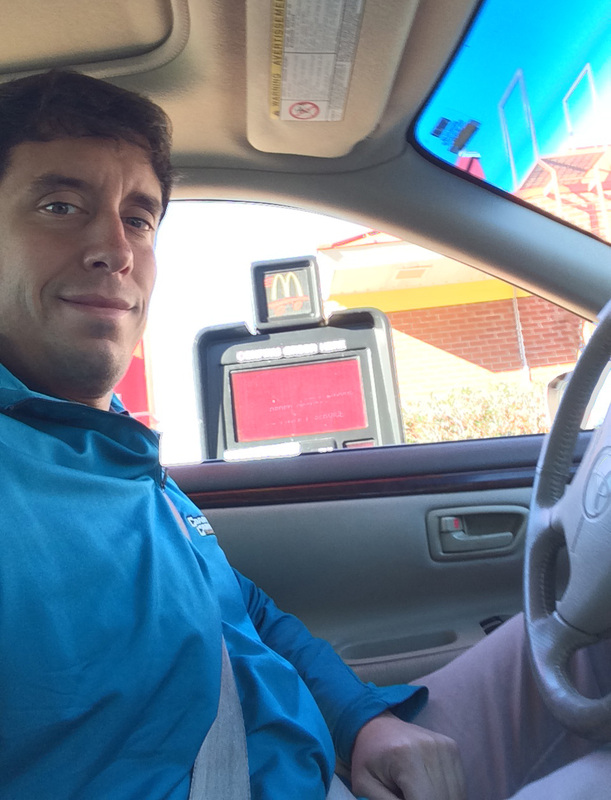 The news about McDonald’s revamped drive-thru strategy hit the media yesterday. Last night, I asked Sidney if I could visit her during lunch today. With it being Thanksgiving week on campus and with all the students gone, it was a perfect opportunity for me to head out to Palmetto Bays Elementary. She said of course and asked if I could bring her, you guessed it, MCDONALD’S. This is me paying for the food. This was the second “ask” step of the process. So today I had the opportunity to experience the “ask, ask, tell” method fresh off of its implementation. Things got off to a rocky start. Sidney wanted chicken nuggets but ordering them at 10 a.m. wasn’t a good idea. McDonald’s apparently doesn’t serve non-breakfast items until after 10:30 a.m. After cutting out of the drive-thru and going the wrong way to a parking spot so I could text Sidney for her new order, it was back up to the intercom for me. This time when I actually ordered something that they were serving at the moment, things went better. I ordered her the sausage biscuit meal without the egg but with cheese. The employee asked if my order was accurate while drawing my attention to the screen. I went to the first window and paid and the woman there rattled off my order and asked it if was correct. I pulled up to the second window and, just like the news articles said, I did have to wait much longer than normal. But the employee gave me the bag with a big smile and told me what was inside. Seamless. 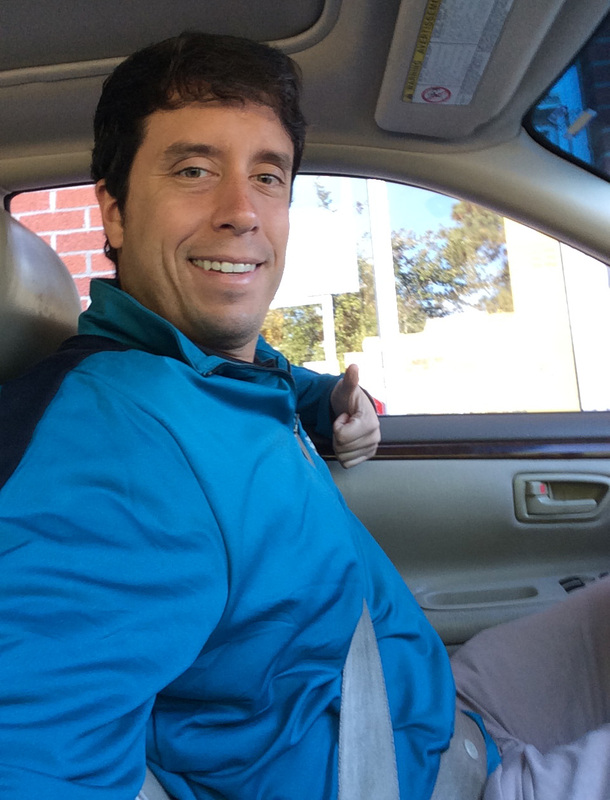 Me happy after going through the third and final “confirm” step of McDonalds’ new drive-thru process. For the first time in what has seemed like forever, the most recent quarterly earnings for McDonalds improved over the previous report. This is another move in the right direction. Don’t Blink. As I will be spending Thanksgiving away from my family in Spokane, Sidney has been too kind to incorporate my traditions within her family’s Thanksgiving celebration. Take for example a popular side dish my mom always prepares for our Thanksgiving meal. To most people it is asinine to eat lasagna with your turkey and mashed potatoes, but to my Italian family it is as common as pumpkin pie. Sidney will be making her best version of my mom’s specialty for the Mathis family’s traditional Black Friday meal. 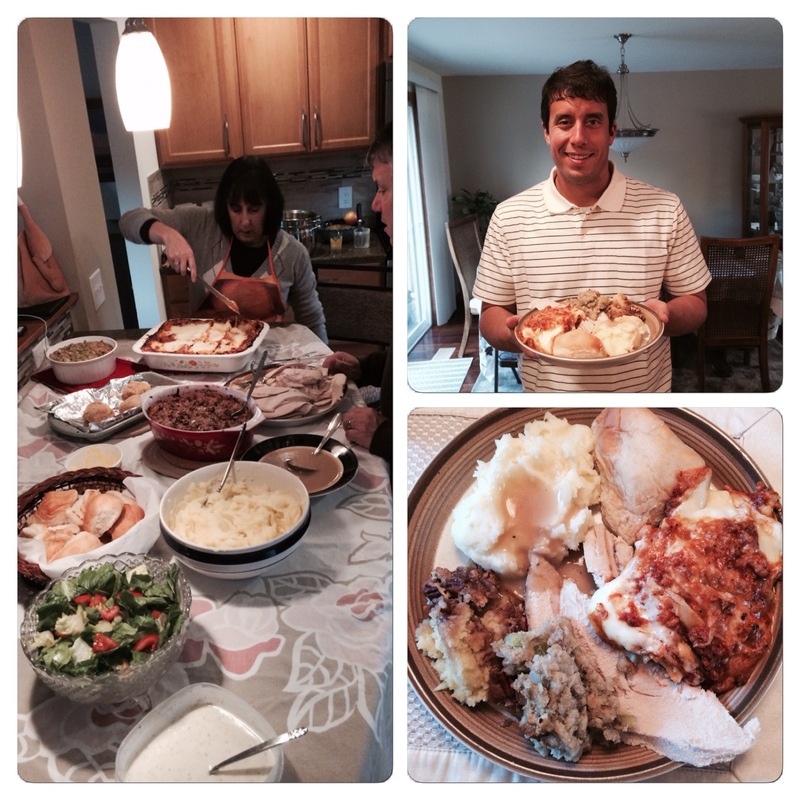 Some photos from our Thanksgiving last year. You can see my mom cutting up our signature lasagna. 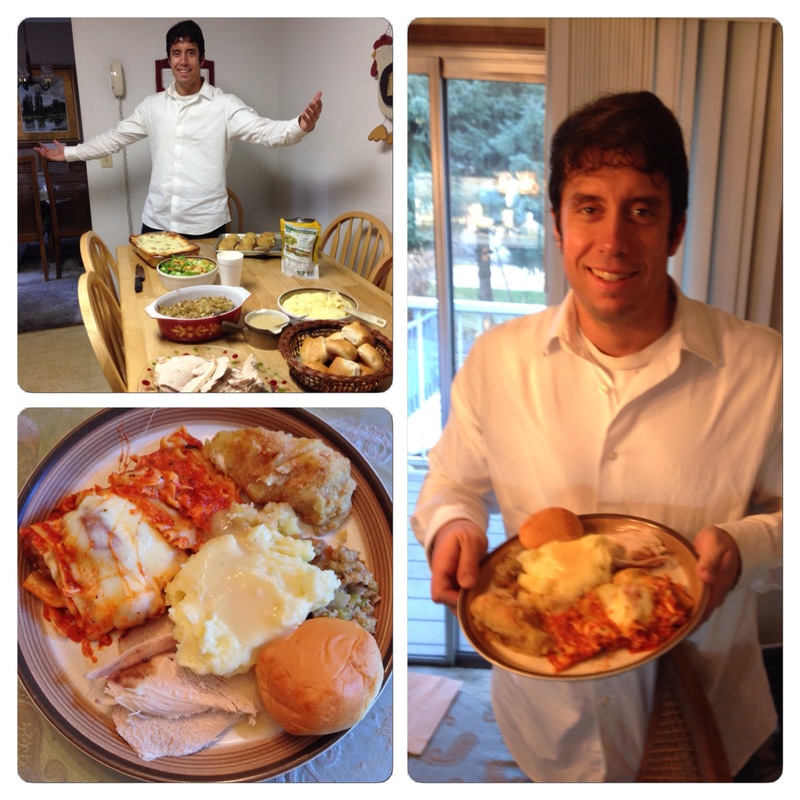 In these shots from Thanksgiving 2013 you can see the lasagna both on the table and on the my plate. I asked Sidney if this Thursday, long after the celebration has concluded at her sister’s house, if we could go to the theater and watch a movie. She said of course! Last Thanksgiving was special for me. It was my first time at home since I moved across the country. We marked the holiday by going to see “The Hunger Games: Mockingjay, Part 1.” I love the Hunger Games movies. They leave you on the end of your seat and the acting is superb. Naturally I asked Sid if we could see “The Hunger Games: Mockingjay, Part 2” this Thanksgiving. She agreed to that request as well. Once again, the lasagna takes center stage during Thanksgiving 2012. Now we have to decide if we will watch the previous three movies over the next few nights to prepare us for the new installment on Thursday. With both of us busy over these next few days and the lack of an 8-hour window available to watch all three films, it will be tough. But if we do watch one movie per night starting later this evening, we can squeeze it in. 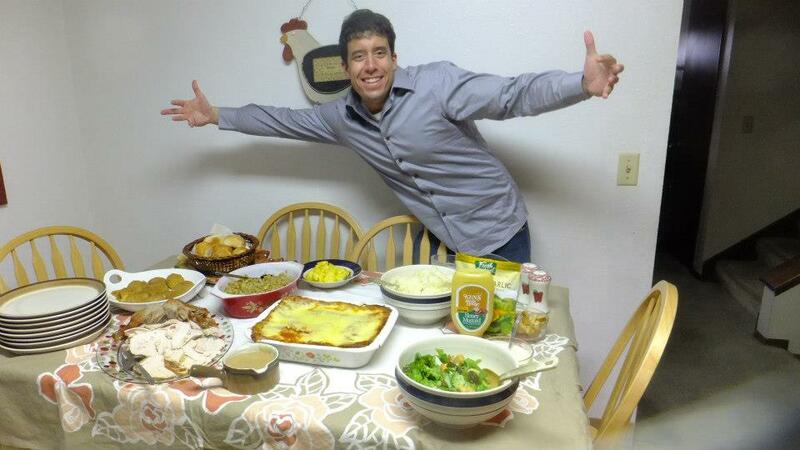 One final Thanksgiving spread photo. You guessed it…lasagna. Regardless of whether we cram the movies in or watch the final film with no prep, I am thankful for one major thing: Sidney is sweet enough and thoughtful enough to honor some of my traditions this Thanksgiving. It will definitely be another blessed holiday. Don’t Blink. An ordeal that had me nervous and angry came to a conclusion late this past week. But was it a happy ending? 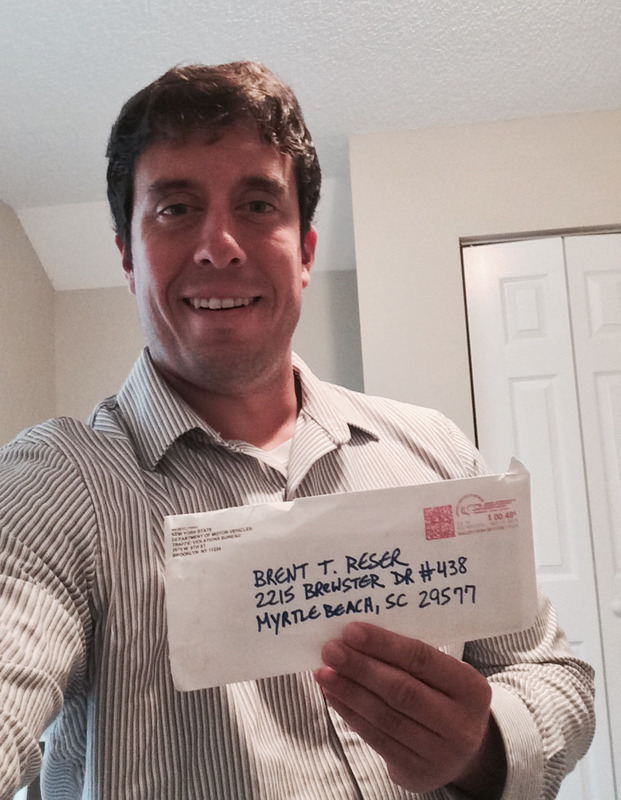 Although I am smiling while holding the envelope that contained the decision regarding my case from the New York State DMV, was it in fact a favorable one? As I documented via this blog (here and here), I had some scumbag steal my identity. This criminal had obtained my driver’s license information and used it when he got pulled over for tinted windows in South Brooklyn. The officer didn’t notice the scam and I was charged with the infraction. When I received the letter in the mail notifying me of the ticket I thought it was a joke, a piece of junk mail that aimed to take advantage of vulnerable people. But when I called the New York State DMV just to be on the safe side the person on the other end of the line told me it was legit. I would have to fight the charge. 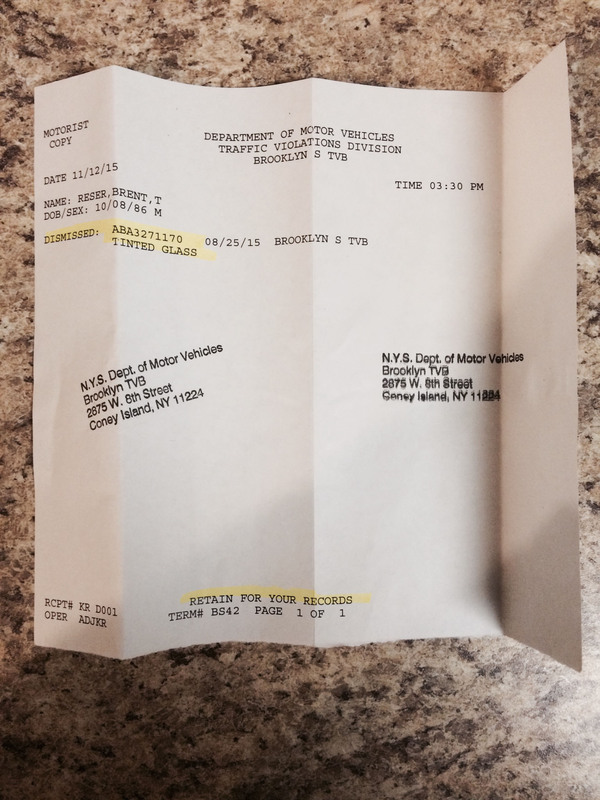 I sent a folder to the Brooklyn South Traffic Violation Office filled with information that screamed my innocence. Of course the affidavit form, which I had to get notarized, came first. I neatly filled it out and used the lines provided to succinctly summarize my case. I found additional space to invite the judge to view the attached information. Next came a letter I typed out that politely explained how it was impossible that the person pulled over on August 25 was me. I wrote in 11 point font and used up the whole page. I explained how I had never driven a vehicle in New York, how I had never used tinted windows, how I had never even sat in the type of vehicle that the con artist was driving when pulled over. I explained my job, my schedule, and my situation, making it more than clear that there was no way in hell that I could have been in New York this past August. New York police officers are supposedly trained to have photographic memories. When I talked to the New York DMV representative on the phone, she told me to include a photo of myself. The officer would know right away if it was me or not when he/she viewed the photo in court. I was going to give them much more than what they bargained for. I took pictures off my refrigerator and included them in the packet. I included a photo from September 1, the image that was taken closest to the infraction date. I included a flash drive that contained numerous photos of me with short hair, longer hair, and wearing a hat. I wanted to make it obvious that no matter my physical state, I could not have been the person with the tinted windows. I made photo copies of my driver’s license. I included my time card from work, clearly showing that I was on the Coastal Carolina campus for the full day on that August date. I even included a newspaper article on myself that not only included an additional photo of me but also was written in a way that effectively conveyed that I am not the type of person to cruise the streets of Brooklyn with tinted windows. My favorite piece of evidence I sent in though was a video of myself pleading my case. I wanted to make sure that the officer just didn’t see me but heard me as well. In two minutes I respectfully thanked the South Brooklyn Traffic Violations Office for the chance to appeal and then I lined out my case. I pretty much summarized the evidence included in the folder, using the video as a big exclamation point. I threw the file on the flash drive that included my supplemental photos. I took all the materials to the post office, placed them in a large manila envelope, and sent it off to New York via certified mail. Wednesday night I received my answer. I ripped open the standard envelope from New York to find my vindication. On a single sheet of paper, the word dismissed was highlighted. My name had been cleared. It was such a relief to get this notice from the South Brooklyn Traffic Violations Office. Of course it is still very concerning that the person who used my identification information is still out there. Will the state of New York trace the license plate number of the car that received the ticket and investigate or question the owner? I doubt it. But fresh off my victory at the mercy of the state, I didn’t want to press it right away. I do hope though that in the near future the officer who took the bait and issued me the ticket will do some police work and try to hold this dishonest person accountable. I am pleased that this situation is now behind me. Thanks to my readers for all the support. While I know something like this could very well happen to me again, I am crossing my fingers that I am good for the time being. Don’t Blink. Good evening to all my loyal readers. As always, we cut the small talk on this day of the week. It is time for the Thursday Rundown! 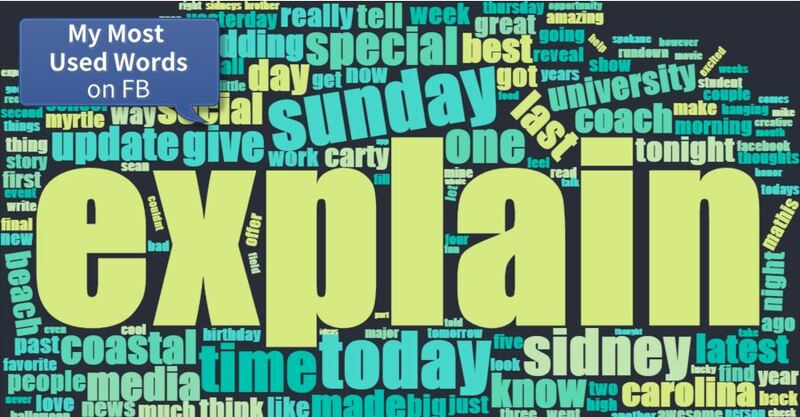 Most Used Words on Facebook: The hottest thing on Facebook at the moment is to utilize an app that will calculate and display the words you say most on the social media giant. I knew even before I decided to run the data that “explain” would be my top word. As most of you know, a signature line of mine is “I explain in tonight’s blog post.” I was happy to know that the words Sidney, Coastal, and Carolina all took up significant space in the graphic as well. These are the words I use the most on Facebook. 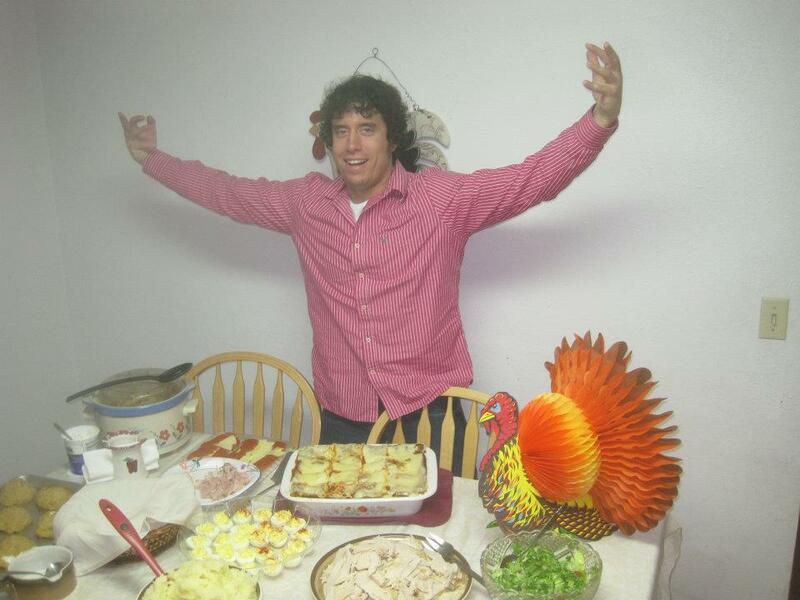 The TEAL Nation Thanksgiving Feast: Yesterday I announced our latest fun initiative for #CCUSocialMedia. Called our TEAL Nation Thanksgiving Feast, I am asking our students to send me photos of them and their families around the Thanksgiving dinner table. Students will take the photos on Turkey Day and send them my way. Then, throughout the Thanksgiving weekend, I will post them to our Instagram account. My goal is to show off the different traditions and food spreads of our numerous Chanticleers. We are staying organized by capping participation at 50 students. The Teal Nation Thanksgiving Feast will take place over Thanksgiving weekend (graphic designed by Ron Walker). Weekend Plans: This Saturday, I will be heading to Columbia, S.C., with Sidney and her dad. We will be making the journey to Williams-Brice Stadium on the campus of the University of South Carolina for some Gamecock football! As I visited Clemson’s Memorial Stadium twice last year, I wanted to make sure to visit the other major stadium in the state this year. Although South Carolina will be playing the Citadel, a FCS foe, I am just really excited to step into a new stadium and watch a football game as a fan. Never Thought I Would See This: According to the Facebook feature that tells you how long you have been friends with someone on the service, I know that my mom recently marked her fifth anniversary on Facebook. How did she celebrate? 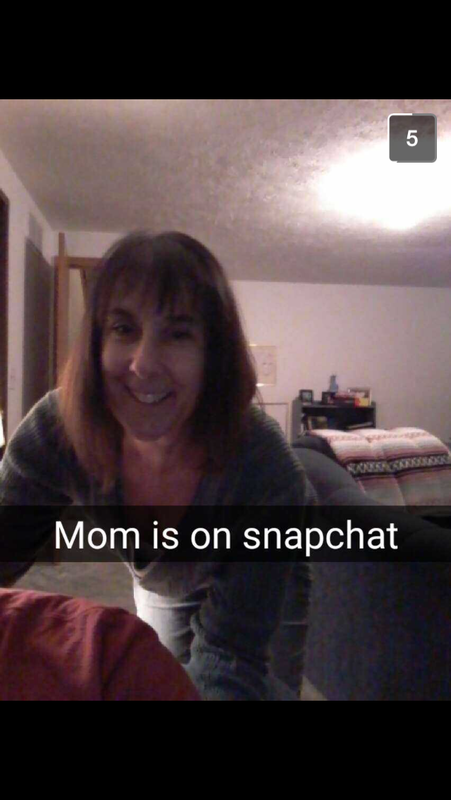 She decided to get a Snapchat account! You read that right, my mom is now on Snapchat. If you would like to add her, type in “marykreser5”. Make sure to follow my mom on Snapchat. Football Shout Outs: The Coastal Carolina football team will close out its regular season this evening with a matchup against Liberty in Lynchburg. Not only is the contest a special Thursday night game but it will also be broadcast nationally on ESPNews. There is much at stake for the Chants as the team tries to wrap up a playoff bye. While I am at the South Carolina game on Saturday, I will keep a close eye on what is going on in Bozeman, Mt. The University of Montana and Montana State University football teams will duke it out in the 115th Brawl of the Wild football game. I can’t express enough how superior the athletic program at the University of Montana is compared to the one at Montana State. With that said, it is always fun to reinforce the obvious each year in football. When I recounted my top ten moments working for Grizzly Athletics, one of the items came from watching Montana destroy the Bobcats in their home stadium. Nothing is sweeter. I am counting on it to happen again this weekend. 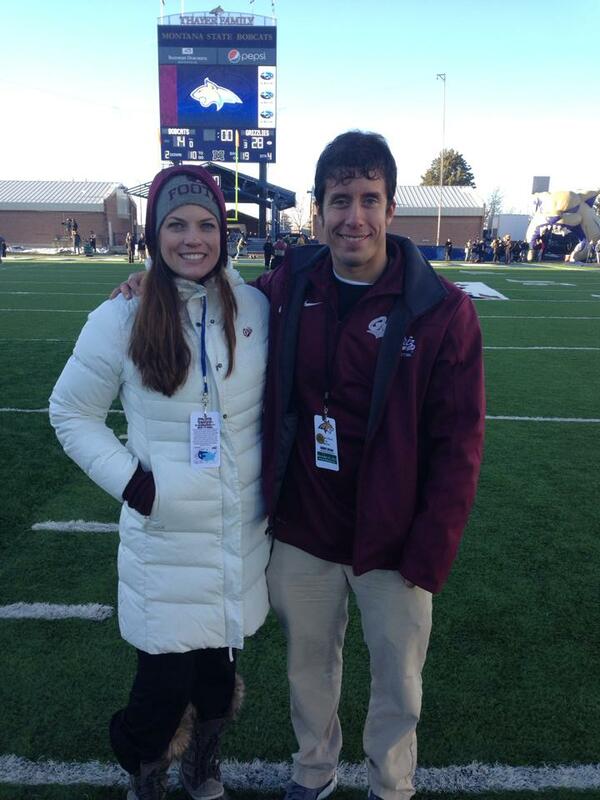 Marketing Director Brynn Molloy and I on the field after another #GrizCat football victory in 2013. Those wins were always sweet. As you learned from my last rundown item, I have some football to watch! Have a great weekend everyone and GO Chants and Griz!! Don’t Blink. In my professional career, I have sweated through my fair share of job interviews. I have also frequently sat on the other side and helped to interview candidates as well. Even with this experience from both angles, I still have a lot to learn. The incentive to continue to educate myself on this skill is high, cause come on, I think we all know that the ticket to the next step in our professional careers is through the perfect job interview. Today I had the opportunity to both improve my interview skills and to sharpen those of someone else. I was asked to help out with an interviewing event put on by our Career Services department here at Coastal Carolina University. Staff members here at CCU and professionals off campus were made available to our students who wanted to complete mock interviews. I interviewed a freshman female. I was given a sheet of questions to ask but we were told we could go off script. After thinking I would stick with what was already written, I did the latter. Now you might wonder what I could possibly learn about the art of interviewing by talking with a student who just started college. But hold off for one second, let’s start with the priority. It shows superb motivation and real guts for a FRESHMAN to show up to a mock interview session. For her to put herself out there in front of professionals at her age is definitely not something I would have done when I was 18. She exposed herself to how real life interviews are conducted and she experienced how you must think critically on your feet. Trust me, I didn’t hold back on the questions. When she graduates in 2019, she is going to be a pro when a prospective employer interviews her. Whenever I sit in on an interview, I try to take a positive from the approach of the candidate. Even if they did not perform well, I try to note something that I could possibly use myself down the road. When I interview younger people, like the student I talked with today, I am always reminded of a crucial component that any candidate must have: humility. Whether you are a finalist for a CEO position or just trying to get your first job out of college, it is important to demonstrate humility during the interview process. From the opinions of people on the hiring committees that I have served on and from my own personal criteria, nothing is worse than a candidate who is arrogant. However, is it possible that even down to earth folks like you and I could come across in interviews as a little cocky? Of course! This is why it is beneficial to interview young people. Most students who walk into interviews know a few sobering facts about their resume: they don’t have experience, they don’t have a degree, and they don’t have many accomplishments. Knowing this, most young people are modest, almost to a fault. 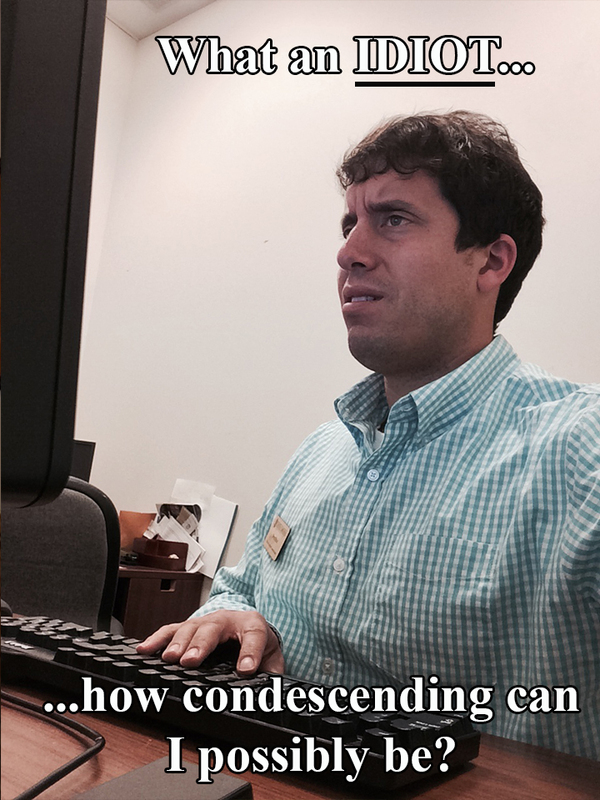 Many compensate for their lack of credentials with an overabundance of respect, politeness, and self-deprecation. Don’t get me wrong, it would be a disaster for someone trying to make the next move in their career to sell themselves short and basically go in with no edge whatsoever. However, the general theme of humility that is characteristic of an interview involving a college sophomore is something we can all take away. I took an hour off work today to throw hypothetical questions at someone who has been in college for three months. Waste of time? No. We both walked out having bettered ourselves. Don’t Blink. This afternoon I once again had the opportunity to meet with my #CCUSocialMedia Student Advisory Group. For this particular meeting I decided to present to them the Top Ten Mistakes Social Media Professionals Make. As most in the room want to work in social media upon graduation, it was a very relevant topic. 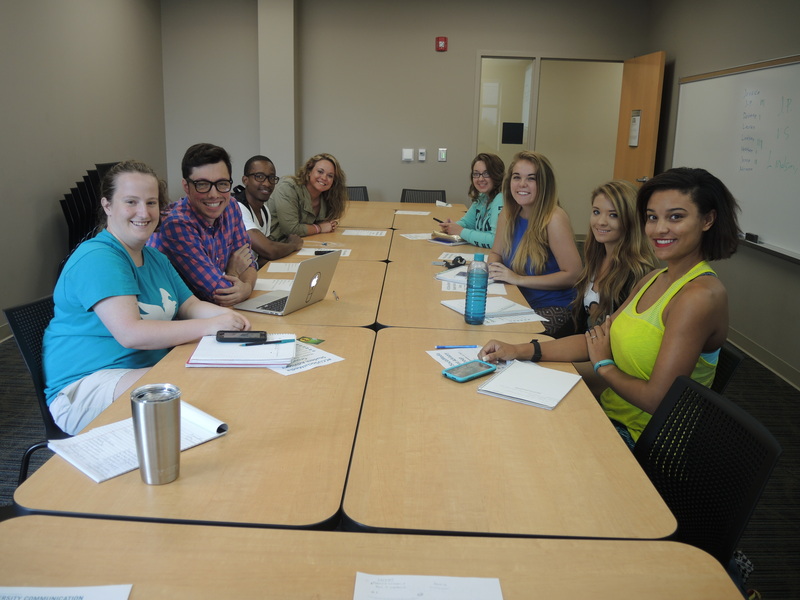 I got to meet with my #CCUSocialMedia Student Advisory Group today. However, I wanted to have fun with how I presented it. For each item on the list I created a stupid meme to go with it. Since not all group members were present at today’s meeting, I decided I would make the material available to them via this blog. Please know that each meme involving me is completely fictitious (I was explaining what not to do). During today’s meeting, each item on the list was complemented with a full slide of information. For tonight’s blog post, each item will be complemented with just a couple sentences. Those costumes aren’t really even that good. Believe it or not, this happens a lot. Social media managers must make it a habit to pay special attention to their smart phones to ensure they are posting to a personal account as opposed to their employer’s account. 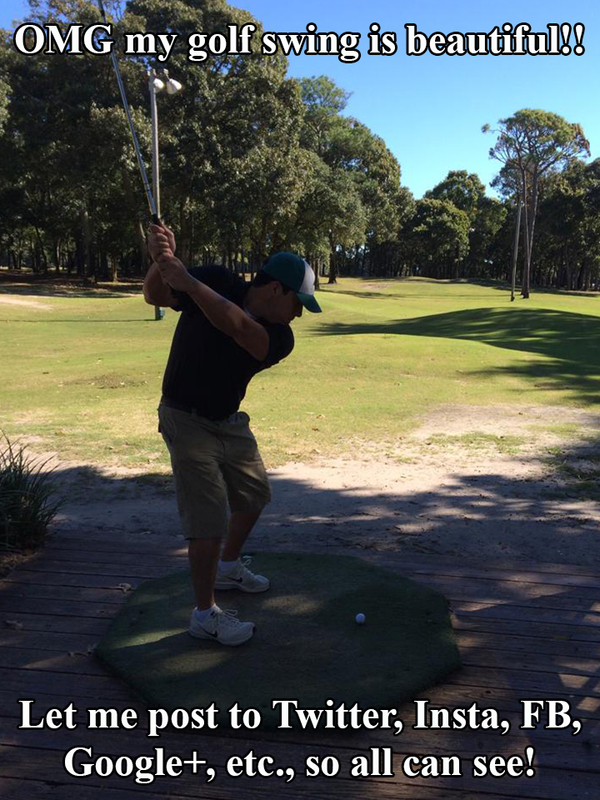 My swing is too ugly to even post to one account. All social media accounts are different and should be treated as such. Unless you want your company to come across as lazy and lacking in social media understanding, never post the exact same content to multiple platforms. 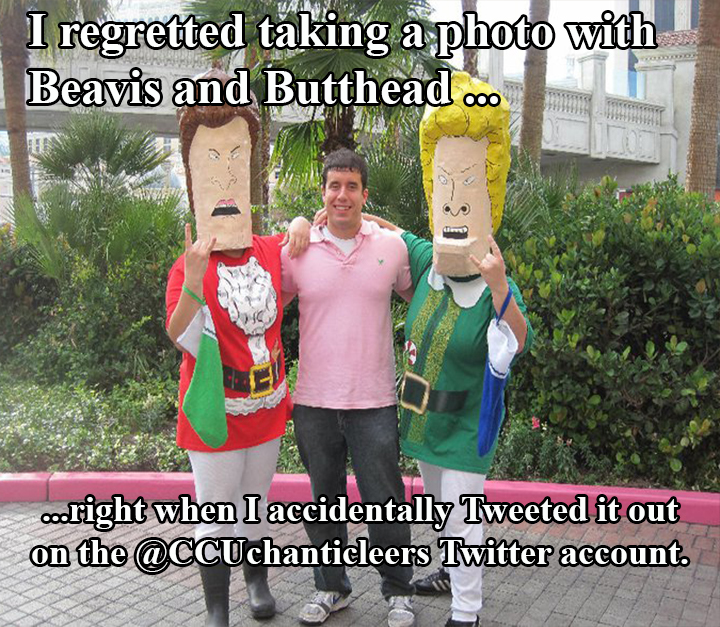 I never considered posting any flood photos on our official @CCUChanticleers accounts. We live in a world of political correctness and whistle blowers. To avoid controversy and embarrassment, don’t post anything that someone can get mad about or offended by. Don’t rely on your inferior skills if someone can do it better. You represent your employer with the content you post. If you have a team that includes designers, videographers, photographers, etc….use them! 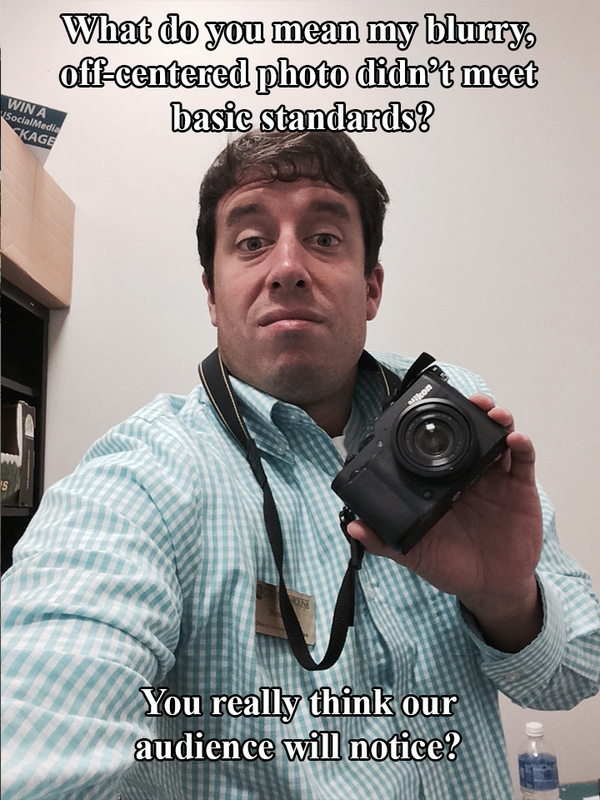 Anything that is blurry or looks like a third grader did it should not be used. Personal preference can cloud your social media judgment. Always depend on analytics. It might not be the most glamorous part of a social media professional’s job, but it is important to analyze and respond to analytics. The top way to make your social media program better is to make adjustments based on what analytics tell you. Interesting fact: I never had a Myspace page. More than most professions, staying ahead of the game in the social media industry is critical. Talk to people younger than you, read newsletters, experiment, and never get complacent. Make sure to put yourself in a position to be at the forefront of new trends. Fortunately, this situation actually turned out really well. 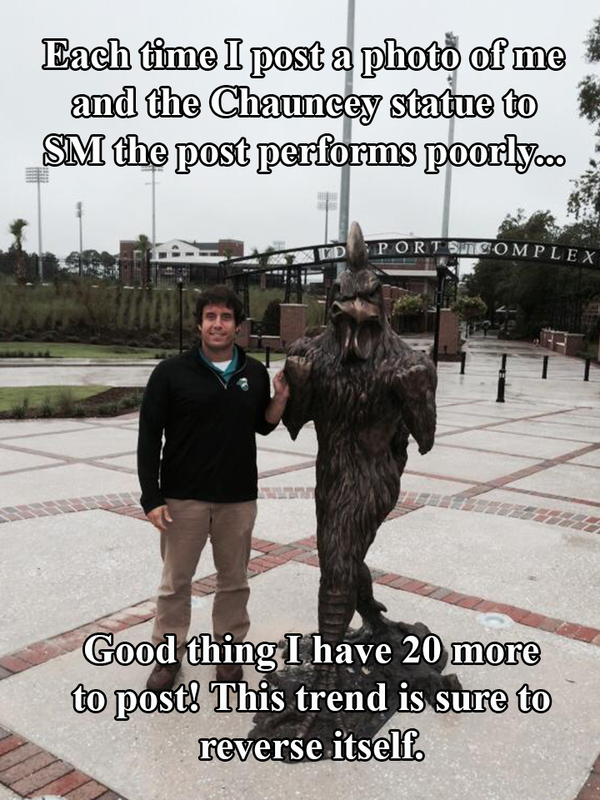 The above meme is in reference to the dialogue our @CCUChanticleer Twitter account had with the Twitter account from the University of Wisconsin this past March. Respectful and witty banter with competing/rival social media outlets is okay but ugly feuds are not. Remember, no one wins when official voices for universities/companies act like kids. Being angry and being a social media professional is not a good thing. We have jobs because of our audience. Always treat your followers well and kill the negative ones with kindness. 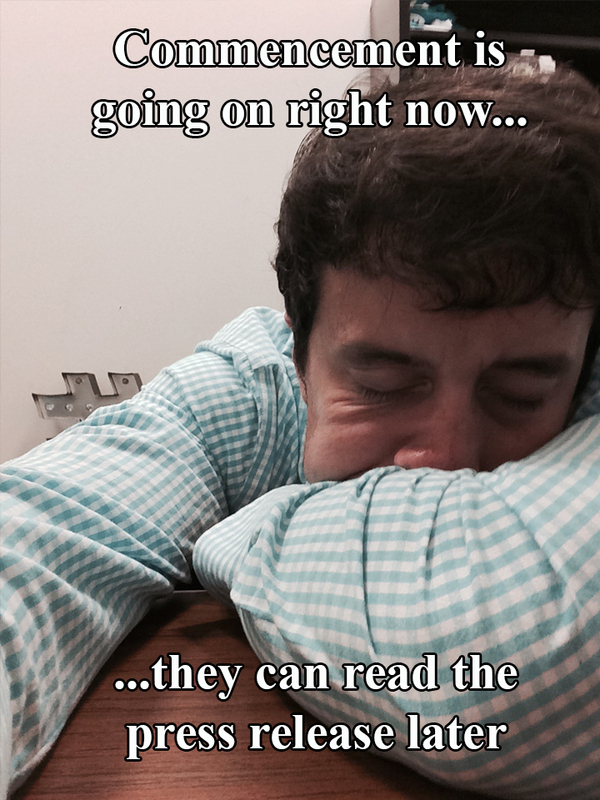 Social media pros can never be found asleep on the job. You want to work in the social media industry? Get ready to always be on the clock. However, don’t go overboard. Realize that 24/7 doesn’t mean you are tweeting from your official accounts for no reason at 3 a.m.
You might feel so lucky and blessed to work in social media but don’t sell yourself short. Social media is a legitimate career route and the value of professionals in this industry is only rising. You are working in a position that is highly influential and highly scrutinized. 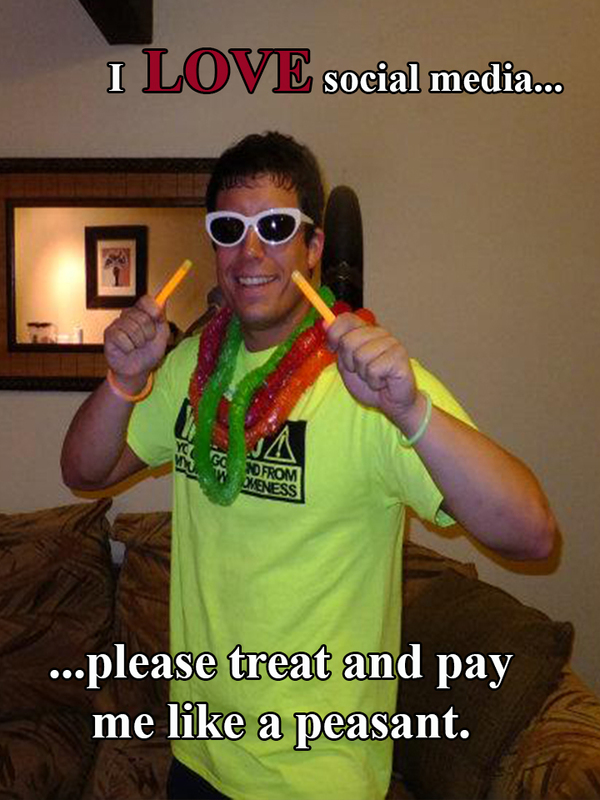 Make sure you are compensated appropriately for it. 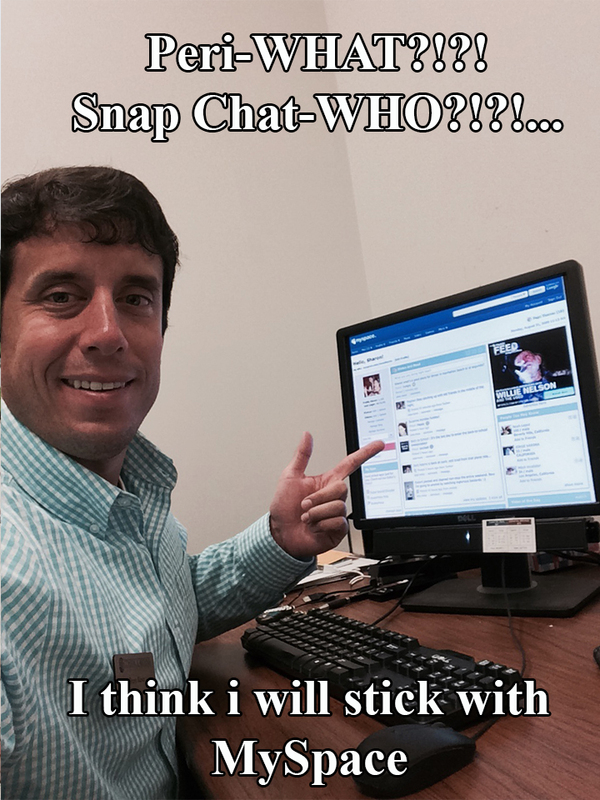 To my fellow social media professionals…do you have any “mistakes” I should add to the list? Believe me, I would love to create additional memes. To all the aspiring social media professionals out there…I hope this taught you something or made you laugh (hopefully both). Don’t Blink. The discussion has been on-going since the NFL turned Thursday Night Football into a weekly thing a few years back. The quality of football for these games, most people reason, is awful. Teams don’t have enough time to prepare or heal up from the previous Sunday and the product suffers. Of course from the players standpoint, who cares about the product? What is at issue here is health. Little rest and a taxing travel schedule threatens the well-being of these professional athletes. To be honest, I don’t get worked up one bit about “the product.” Football, especially at the NFL level, is football to me. I can’t tell too much of a difference between a Sunday afternoon game and a Thursday night game. As for the concerns of the players, although I am a little more sympathetic, these athletes are still all getting paid six figures with many earning multi-million dollar paychecks. They travel like kings and enjoy access to the best trainers in the business, they can manage. I dislike Thursday Night Football in its current form for a whole different reason. Although I can’t argue with the popularity of the league, I think the NFL weekly schedule is oversaturated. You now have a full slate of games during the day on Sunday, a Sunday evening game, a Monday night football game, and a Thursday night football game. Not too long ago, your team played on Sunday or there might be the rare/special occurrence every couple years where your team would play on Monday night. Now, with Monday Night Football doubleheaders, random Saturday games, and a weekly Thursday night game it seems like there is a greater possibility that your team WON’T be playing on a Sunday. Thursday games used to be sacred. You know why? Because it meant that the game was being played on Thanksgiving. The mystique of the Thanksgiving game is gone for two reasons: One, Thursday night games are played all season long. Two, Thanksgiving day in the NFL goes from morning to evening with a triple header. The current slate of Thursday night games just aren’t special. How can you appreciate these games when the players publically say they hate them and you have to cruise high up on the dial to watch them? (NFL Network has taken over televising the remaining contests this season). Monday Night Football and Thanksgiving contests are/were special because you had the feeling that everyone was watching. You don’t get that with Thursday football. The NFL made the exact same mistake that Major League Baseball did with interleague play. When MLB Commissioner Bud Selig debuted it in 1997 the games were numbered and the out of league opponents were few. The All-Star Game and the World Series still had its luster. But then MLB continued to expand the interleague schedule and increase the opponents each team would play. These days, they might as well just merge the American League with the National League. Major League Baseball let interleague play get out of control and tradition suffered. The same result has happened with the NFL football weekly schedule. During the season, I don’t think it is a good thing that the NFL is played on 43% of the days of the week. I know in our current landscape, the NFL can do no wrong. Many of you might think I am crazy. But weekly Thursday Night Football doesn’t feel right to me. Give college football Tuesdays, Wednesdays, Thursdays, Fridays, and Saturdays…the NFL can manage perfectly by simply holding down Sundays and Mondays. Don’t Blink.